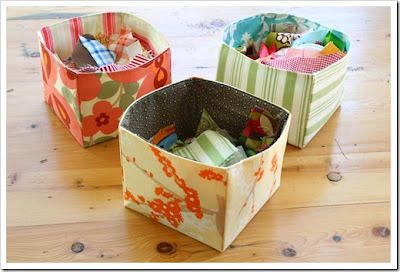 I came across this fabulous blog- The Sometimes Crafter- and she had this beautiful tutorial for making fabric scrap baskets! These would be great for holding craft supplies (such as fabric scraps) or children's toys. Or you could put them on a bookshelf to store books, or in a child's room to store clothes! Thanks for the link! I love the Sometime's Crafters blog, but hadn't seen this yet.